Few topics dominate the checklist of people looking to move than the age-old debate of the pros and cons of buying a new home as opposed to an older one. Former Surrey residents Alan and Marian Reid were certainly no different when Alan retired after over 40 years as Head of Sport at prestigious Reigate Grammar School. Marian says: “Our previous home was a period property and although absolutely brimming with character, we had spent many years carrying out maintenance on it. When Alan retired, we both agreed that we would look at buying a low maintenance new home as we also love travelling so were keen to indulge that passion more. It is evident that Langham Homes has thought of those little extra finishing touches that not all developers consider and those that make you feel right at home immediately”, Marian concludes. Laura Parkinson, Sales Manager of Langham Homes comments: “We undertake research to ensure that our designs blend with the local vernacular and all of our homes are designed internally to reflect the realities of today’s modern family life with the flexibility of large open plan areas, which has largely superseded the separate rooms favoured in older properties. New homes are generally more energy efficient than their older counterparts too with the increased use of underfloor heating and crucially, the purchaser often gets to stamp their mark on a new home rather than living with a previous owner’s taste in decor and having to decorate as soon as they move in”. 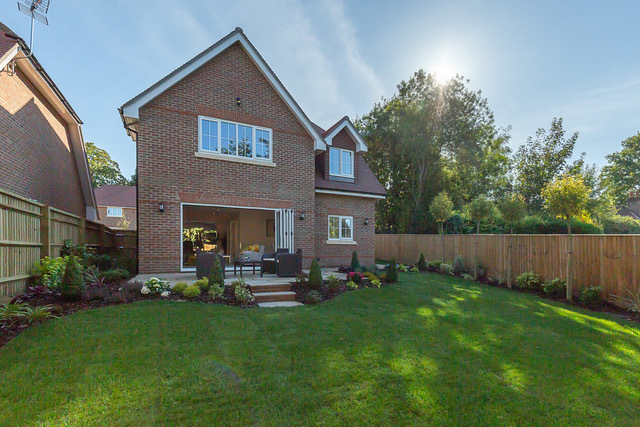 With 50% sold, only two detached houses are available at Ashurst Copse. Maple Lodge with a detached single garage is priced at £895,000 whilst Oak House with an integral single garage is priced at £850,000. Please contact the selling agent Cubitt & West in East Grinstead on 01342 314324 for an appointment to view either of these fully furnished show homes.